Dr. Eric Boyle spoke today at the National Library of Medicine on “In the Belly of the Beast: A History of Alternative Medicine at the National Institutes of Health.” Dr. Boyle is Chief Archivist at the National Museum of Health and Medicine. Circulating Now interviewed him about his work. Eric Boyle: I grew up in San Luis Obispo, CA and went to grad school at the University of California Santa Barbara. After a year of teaching at the University of Wisconsin-Madison, a postdoctoral fellowship in the Office of NIH History brought me to DC, where I’ve lived for eight years now. I’m the Chief Archivist at the National Museum of Health and Medicine and I’m also a lecturer at the University of Maryland. My work as an archivist is typically varied, and includes research and writing, tracking down items in our collections, and organizing and preserving documents, photographs and films. In the history of public health course that I teach I’m also able to incorporate material from the museum’s history and collections. CN: Would you tell us about the work you presented in your lecture, “In the Belly of the Beast: A History of Alternative Medicine at the National Institutes of Health”? EB: The research for the lecture really began in 2008, the first year of my Dewitt Stetten Postdoctoral Fellowship at the Office of NIH History. At that point in time, the National Center for Complementary and Alternative Medicine (NCCAM) was celebrating its ten-year anniversary. I quickly learned that the NCCAM had dramatically expanded the scope of its work in a relatively short period of time, but I was even more interested in the earlier history of its predecessor organization, the Office of Alternative Medicine (OAM), which had been created in 1991. What little had been written about the early history of the OAM made it pretty clear it was a fascinating story, involving questions about the relationship between politics and medical research, the nature of medical knowledge, and how different people defined the boundaries between mainstream medicine and its alternatives. CN: The legislation that eventually led to the NCCAM (now called NCCIH) had both skeptics and advocates, were you drawn to any particular individual’s story? EB: It’s tough to choose. 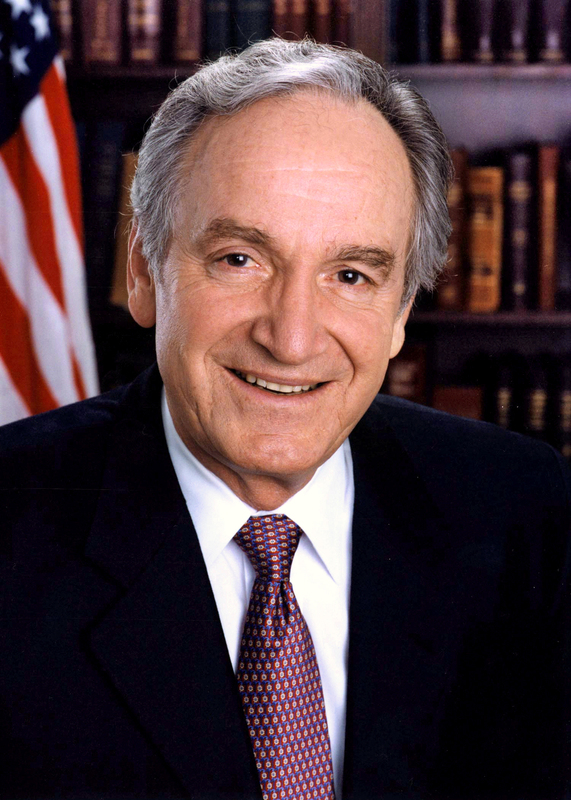 The story of how Senator Tom Harkin became the key figure behind the creation of the OAM is pretty fascinating. Two close allies of Harkin, Berkeley Bedell and Frank Wiewel, each have great stories to tell. Bedell was a longtime friend of Harkin and a former member of the House of Representatives, and he believed that alternative medicine had twice cured him of diseases after mainstream medicine had failed. Wiewel had been a longtime supporter of a controversial alternative treatment for cancer and started up an agency designed to be a referral service for therapies that had been labeled “unconventional.” Bedell and Wiewel also became members of the advisory panel for the OAM and in many ways epitomized one of the primary challenges facing OAM—the political pressure to produce particular results often conflicted with the scientific mission of the NIH. Participation of figures like Bedell and Wiewel on the advisory board also left the OAM vulnerable to critics and skeptics, who argued the research was politically motivated, and therefore unavoidably flawed. CN: What sparked your interest in this subject? EB: I first became interested in this subject as an undergrad, after I took a medical anthropology class. I was particularly intrigued by one of the assigned books, Health and Healing: The Philosophy of Integrative Medicine and Optimum Health, by Andrew Weil, who was already gaining fame as an “alternative medicine guru.” Shortly after that I had to choose a topic for my senior thesis and I decided I wanted to learn more about the history of alternative medicine. 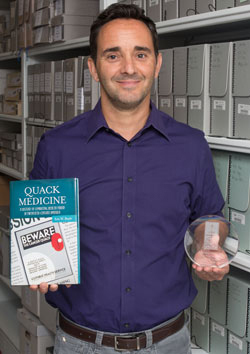 Work on that thesis ultimately became the inspiration for my dissertation, which looked at some of the boundaries between “orthodox” and “unorthodox” medicine, and that became the basis for my first book, Quack Medicine: A History of Combating Health Fraud in Twentieth-Century America. CN: This is very recent history, what sources did you find most informative as you conducted your research? EB: Doing more recent history can definitely be a challenge, partly because conventional archival sources can be surprisingly difficult to find. Thankfully, some of the records from the Office of Alternative Medicine and the early NCCAM years had been preserved at the Washington National Records Center in nearby Suitland, MD. We were able to negotiate the transfer of those records to the Office of NIH History. Letters, memos, and emails between various stakeholders have been some of the most informative and insightful sources. Dr. Eric Boyles’s presentation was part of our ongoing history of medicine lecture series, which promotes awareness and use of NLM and other historical collections for research, education, and public service in biomedicine, the social sciences, and the humanities. Thank you for the article. 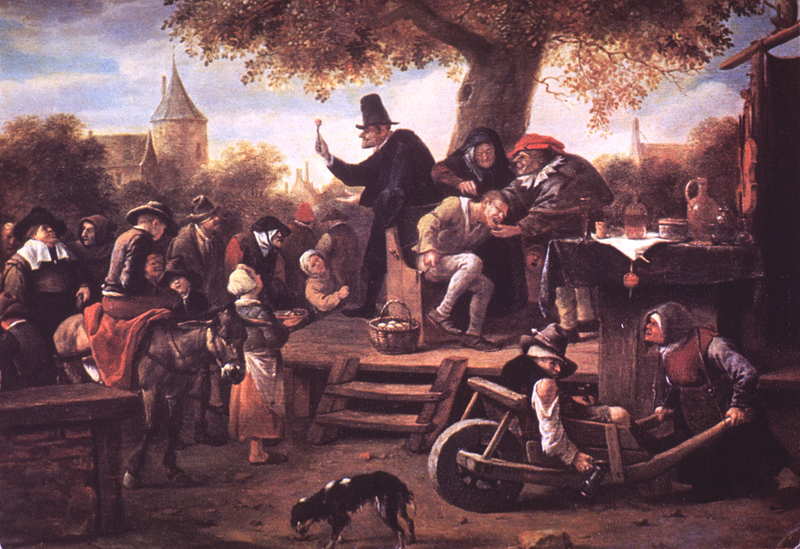 Jan Steen, pronounced stain, has always been a favorite of mine; a Netherlandish genre painter I have found his work amusing, full of vitality, action ,and disorder. The Quack is one I had not seen. One of the main reasons why alternative medicine and quackery in general has and continues to enjoy popular acceptance is the well known 40 % placebo effect.